Rarely does one venture into marshlands in winter. The path of planks can't be seen, and the cold wind blows over the snowy bog. The only advantage is that there are no mosquitos. 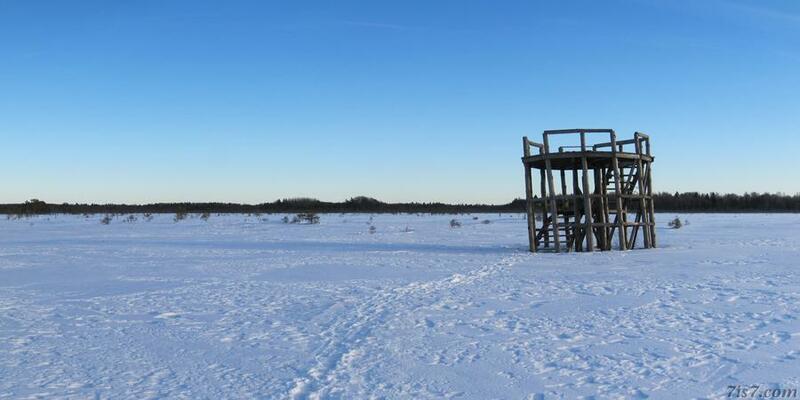 Keava bog is a marshland located in Raplamaa, not too far from Tallinn. The bog is protected as part of the Kõnnumaa natural park. In summer it's a patchwork of little lakes and soggy ground. The next two panoramas looking north and south from the observation tower. Location: 58°56'16"N 24°58'26"E on: Google Maps, OpenStreetMap, Maa Amet.